The event has been started at the Apple Park Campus in Cortito, California. Apple has screened the Apple Watch Series 4 during the event. 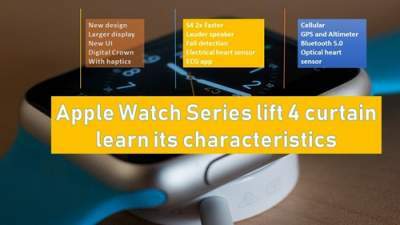 Compared to Apple Watch Series 3, Apple Watch Series 4 smartwatch will come up with new designs, large displays, and thin bezel. The new Apple Watch Series 4 is waterproof but you will also get an ECG feature and optical heart sensor. During the launch event, the company's CEO Tim Cook claimed that Apple Watch is the best-selling watch in the world. The company has focused primarily on connectivity, fitness, and health, in three main things to create a SmartWatch. Apple Watch Series 4 costs $ 399 (about Rs 28,700). At this price, you will find a simulated model which will only come with GPS support. The price of GPS and SIM support variants is $ 499 (about Rs 35,900). The price of Apple Watch Series 4 is worth the price of the Apple Watch Series 3 launched last year. Pre-booking of Apple's new series 4 will begin on September 14. Sales of GPS variants and GPS + SIM support variants will start in the market from September 21 to 26. New Watch Operating System 5 will be available for the Apple's other watch models from September 17. Apple Watch Series 4 SmartWatch will meet in three aluminum finishes. Apart from Silver and Space Gray, Gold stainless finish variants have also been introduced. As Apple Watch Series 4 launches, the price of Apple Watch Series 3 has been cut. Now Apple's Watch Series 3 has a starting price of $ 279 (about Rs 20,100). India has not taken the curtain from the price of Apple Watch Series 4. But hopefully, the company will announce this soon. Apple Watch Series 4 has a 30 percent larger display than Apple Watch Series 3. New Watch 40mm and 44mm will come in two variants. The design of Series 4 is very similar to Series 3. But in the new Apple Series 4, you will have to see changes in the place of the microphone to reduce the edge-to-edge design and echo. Compared to Series 3, Apple's new Smartwatch uses a new GPU with a 64-bit dual-core S4 chipset. Because of the new chipset, the performance of SmartWatch will be up to two times faster. Series 4 uses the Next-Gen Accelerometer and gyroscope sensor, whose dynamic range is 2x. Speaker of Apple Watch Series 4 is 50 percent faster. The microphone has been removed from the speaker to reduce the echo. Apple Coop Jeff Williams said that the back panel of Apple watch is made up of black ceramic and cephalic crystals. Apple's new Smartwatch has built-in fall detection which alerts emergency service and notifies SOS contact. Not only this, Apple Watch Series 4 will send notifications when you have a low heart rate and also provide atrial fibrillation and electrocardiogram (ECG) alerts. Jeff Williams said that this is the first product in which there is ECG support. There will be a result store in your iPhone's Health app. Users can convert the result to a PDF file. These Health Facts will be made available to users in the US by the end of this year. The new smartwatch will be waterproof, it will come with Bluetooth version 5.0 and optical heart sensor support. Apple Watch Series 4 will run on the latest watchOS 5. The UI has been optimized due to its large display.